Whip-It is an earth friendly miracle cleaner with hundreds of different cleaning uses. It is strong enough to eliminates grease and grime from the garage to the kitchen but at the same time won’t harm the environment. The natural formula in Whip-It can loosen up, break down and lift all types of stains. This includes stains caused by heavy dirt, food, paint, wine, juices, rust, grease, oil, grime, mildew, grass, dirt, tar, crayon, and much more. Whip-It works great as an all purpose cleaning solution at homes, offices, public buildings, restaurants or in your car. It is excellent on grout, sealed marble, granite, fabrics, carpet, tile, upholstery, sails, canvas, teak, vinyl, laundry, outdoor furniture, wooden floors, tools, engines, fiberglass, and countless other surfaces.! The formula in Whip-It contains natural disinfectants, natural eucalyptus and enzymes for a superior cleaning solution. There are no artificial perfumes or toxic fumes used in the product. Plus does not contain any chlorine, bleaches, ammonia, phosphates, petrochemicals, acids or dyes. It is completely safe to use around pets and children and safe for the earth too. A single 32 oz. 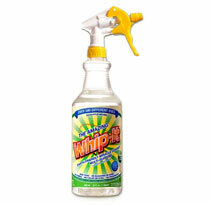 bottle of the Whip-It cleaner normally sells for $14.99 plus shipping and handling. But currently there’s a buy 1 get 1 free offer that is available. You’ll receive a second bottle of Whip-It for free. You just have to pay the additional shipping and handling for the second free bottle.